Ram das: Was ist Sadhana? Gopi.de is a non-institutional page for bhakti-yoga, dedicated to the transcendental love to Radha and Krishna out of pure attraction without any conditions or rules and regulations – natural bhakti. We are happy to present these unconventional aspects of raganuga-bhakti (spontanous love to Godess-God), as we found them in the Vedic texts like Bhagavad-gita and Srimad Bhagavatam and the scriptures of our acaryas (teachers) like Rupa Goswami, Vishvanatha Cakravarti Thakur, Bhaktivinoda Thakur, Bhaktivedanta Swami Prabhupada, Bhaktivedanta Narayana Maharaja and others. We are greatly indebted to all our guru-varga, our disciplic succession. Raganuga-bhakti, as described bei Caitanya Mahaprabhu in Sanatana Siksa (Caitanya Caritamrta 2.22.104 ff.) is a kind of bhakti which takes the inhabitants of transcendental Vraja as paradigm for our performance of bhakti. 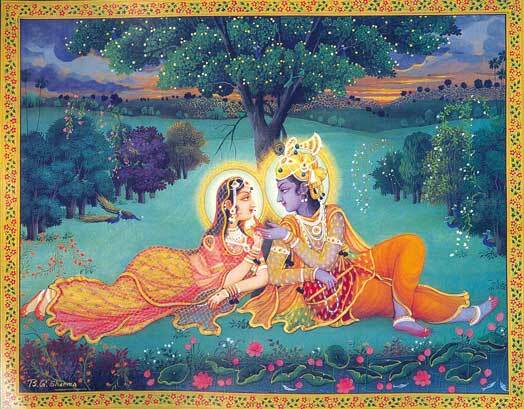 We like the moods and the pastimes of Radha and Krishna in Vrindavan and her and his friends, relatives and conjugal lovers and strive to reach the same kind of bhakti-mellows by becoming part of these pastimes. In our sadhaka-deha, in our material body, we therefore perform the angas, the limbs of bhakti. There are innumerable varieties of angas and whatever anga one chooses for his bhajan is right. There are no strict regulations in this regard. All this is done by attraction, not by force. This helps us to awake the eternal internal love to Godhead in our heart. The most popular angas are nava-anga-bhakti, the nine processes of sadhana-bhakti: sravanam kirtanam smaranam adi = listening, singing, remembering etc. Caitanya mentions 64 angas in his instructions to Sanatana Goswami but also states that there are innumerable more. Finally everything depends on the innermost heart of the bhakta, because every soul is individual and has her specific kind of relation to Radha-Krsna. Science without faith leads to doubts, faith without science leads to superstition. This page is for the scientific as well as the spiritual research in eternal truth. This page is not fit for pre-rational mythological approaches. One who has reached liberation does not lament or desires anything. He is in equal vision towards every living entity. In that state he attains pure bhakti to Me. Pure bhakti starts after liberation. Liberation means the achievement of the brahma-buta-stage („brahma butah prasannatma …“). Brahma buta is the first and basic stage of enlightenment, the realization of brahman. This means not to desire or to reject anything, being satisfied in the self by transcendental joy and seeing all living entities with equal vision. In this state it is possible to attain pure bhakti, love to Godhead, without any conditions. Love to Godhead is not identical with love to humans or living entities. Because God, Krishna, is the origin of everything and the most powerful energycenter which can free a human entity from illusion, egoism and ignorance in all respects, the loving relationship to Him gives perfect knowledge, inner peace, eternity and the highest transcendental bliss. God therefore is the most ideal adress for our love. Still this love radiates to all living entities. The wise does not see any differences in the living entities but sees them all in love because he knows that they are all eternal parts and parcels of God, meant for His glorification. This knowledge is not about morality but about the inherent ontological quality of reality and especially the living entities. In consideration of these ontological axioms (God, the living entity and the love inbetween them) our existence starts to make sense. We invite all people interested in bhakti-yoga to read our page. The main work here is „Natural Bhakti“ by Ram das, Germany. You can order it as printed book or download the ebook.